Datalogger support software packages help enable datalogger programming, communication between dataloggers and PCs, and, to varying capabilities, real-time and historical data monitoring. 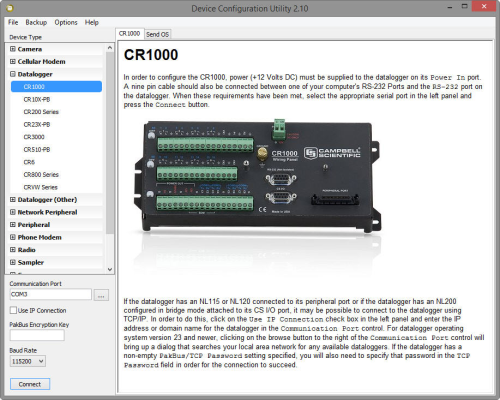 These software packages provide support for a single station or an entire datalogger network. Where is the Transformer tool? Transformer is available within LoggerNet 3.2 and higher. From the Windows Start Menu, navigate to LoggerNet3.0 | Utilities | Transformer. In LoggerNet 4.x, from the main LoggerNet window, navigate to Program | Transformer. Does Campbell Scientific software contain spyware? No. The libexpat.dll module used by some of our applications is sometimes identified as spyware by anti-spyware programs. It is an open-source XML parser, not spyware. Is there a version of LoggerNet that will run on a Linux computer? Yes. LoggerNet for Linux (LNLinux) allows the LoggerNet server to be run on a Linux computer. The LoggerNet server collects and stores the data, while setup and management of the network are easily handled from a Windows computer running LoggerNet Remote or, rather tediously, using Cora Command on the Linux computer.